How Are Virtual Worlds Organized? How Do We See the Virtual World? How Is Physical Behaviour Defined? How to Add Content to the Virtual World? How to Control the Virtual World? This article covers UNIGINE-specific terminology and concepts and is highly recommended for all new users. When you create an application on UNIGINE, it is represented by a project. A project is a "container" for the application code, content, and meta-data. A project can consist of one or several complex 3D scenes, which are called worlds. 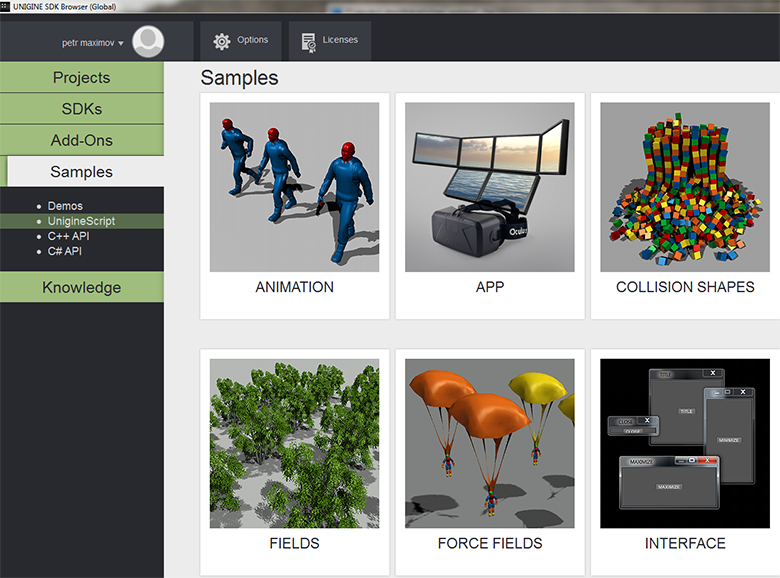 All projects are managed via the UNIGINE SDK browser. 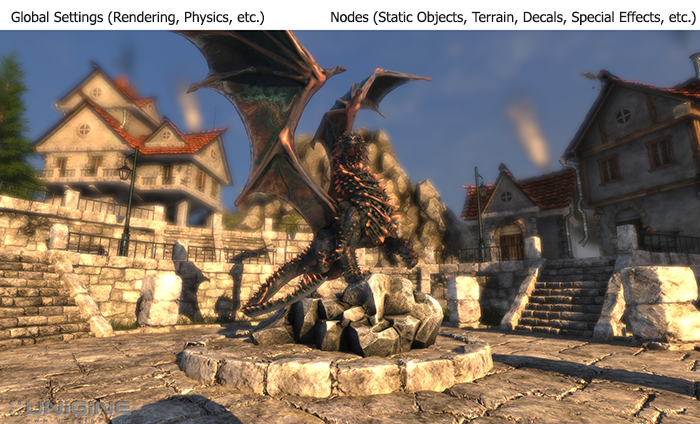 A UNIGINE-based virtual world is a 3D scene that contains a set of different scene graph nodes (e.g. static meshes, lights, cameras, etc.) placed into specified positions, and global settings (rendering, physics, etc.) applied to the whole scene. A scene graph in UNIGINE is a multi-root tree (hierarchy) of nodes. Each world is represented by the XML file with the .world extension. In terms of UNIGINE, all objects added to the scene are called nodes. Nodes can be of different types, determining their visual representation and behavior. There is a rich set of built-in node types. Though the set covers almost all of required cases, it can be manually extended by the user. Every node has a transformation matrix, which encodes position, rotation, and scale of the node in the world. There are node types which appear visually: Objects, Decals, and Effects. All of them have surfaces to represent their geometry (mesh). Other node types (Light Sources, Players, etc.) are invisible. Node parameters are regularly stored in the .world file, but also can be saved into a separate XML file with the .node extension (and later be referenced from the .world file via the special nodes called Node References). Each mesh has one or several surfaces. A maximal number of polygons per surface is 2147483647 (ObjectMeshStatic, ObjectMeshSkinned) or 65535 (ObjectMeshDynamic). There are 2 UV channels for texturing. An animation in UNIGINE can be performed by skinned meshes (bone-based), morph targets (keyframe) or dynamic meshes (code-controlled). In the runtime, meshes are stored in proprietrary UNIGINE formats with .mesh (static mesh + optional animation data) and .anim (external animation data) extensions. When importing an FBX model to the engine, it is automatically converted to the .mesh format. Meshes can also be imported directly via the UNIGINE plugins built-in to 3ds Max or Maya. If you want parts of your object to have different materials (e.g. transparent / opaque, shiny metal / human skin), you should split your mesh into surfaces. However, if you want parts of your geometry to move separately (e.g. spinning wheels of a car), you would need several separate meshes. A surface is a named non-overlapping subset of the object geometry (i.e. object mesh). Each surface can have its own material or property assigned. It is also possible to enable/disable surfaces independently from each other. Surfaces can be organized in a hierarchy within a mesh (it can be used for LOD switching). 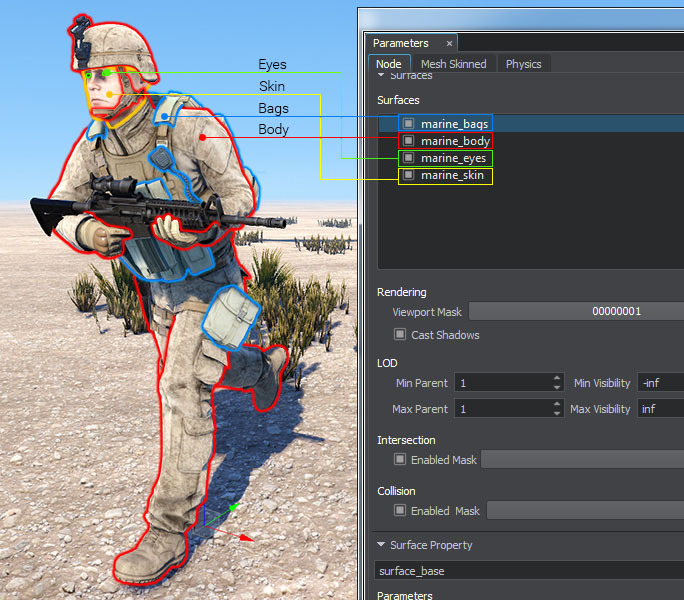 At the picture below, a soldier 3D mesh consist of 4 surfaces: eyes, skin, bags (body armor, radio set, bag), and body (overalls, shoes, hard hat, gloves). Vertex, fragment and geometry shaders that actually draw the material based on different conditions. User-defined textures passed to shaders. States that specify conditions, basing on which the appropriate shaders will be applied. 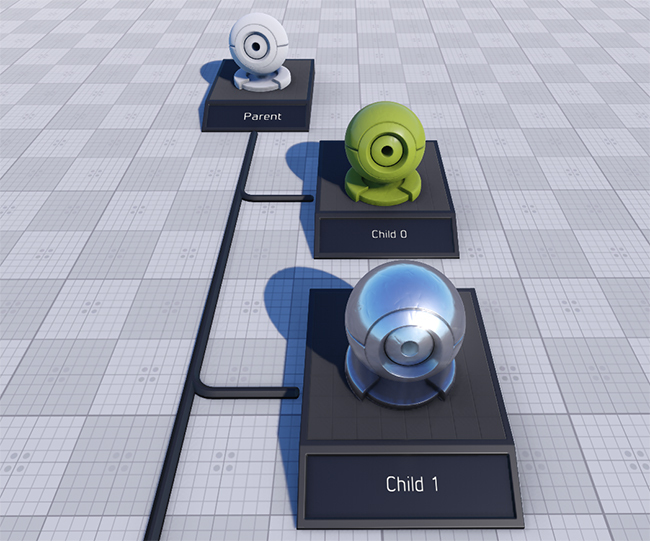 Parameters defining how shaders will be used. UNIGINE provides a rich set of built-in base materials out of the box. The recommended way is to inherit a new user material from a base one and tweak it. You can also create custom shaders either using UUSL (Unified UNIGINE Shader Language) or HLSL/GLSL, but in the latter case you would need to migrate your custom shaders with every SDK release by yourself. In addition to regular materials applied to certain surfaces, there is a special type of materials called post materials, that are applied above the final screen composition. Materials are organized in hierarchy with parameters inheritance and overloading (much like in object-oriented programming). When a material is inherited, all its parameters are inherited from the parent. If a parameter value is changed for the parent, it will be automatically changed for the child as well, unless it was overridden (set to a different value) for the child before that. Example: a material A has two parameters (color: blue and specular power of 1.4), a material B is inherited from the material A and has color parameter overridden (red). If we change specular power to 2.0 in the material A, then the material B will have the following parameters: red color (overridden) and 2.0 value of specular power (inherited). By using parameter inheritance it is very convenient to mass control values of multiple materials parameters. A property is a "material" for application logic. It specifies the way the object will behave and interact with other objects and the scene environment. Properties can be used to build components to extend the functionality of nodes. Properties, like materials, are organized in a hierarchy with parameter inheritance. Properties can be applied either per-surface or per-node. 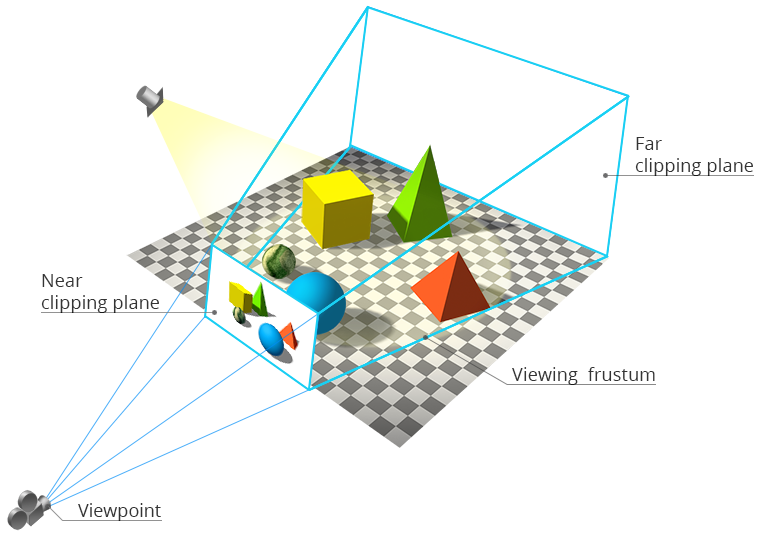 For visual representation, UNIGINE uses a standard perspective projection. The orthogonal projection is also available. A camera is a structure containing 2 matrices: view and projection. Through this structure, you set the camera parameters: field of view, masks, near and far clipping planes, and post materials. Then, the camera is passed to a Viewport that will render an image from this camera. The camera is also set to the Player that will further control its position. A viewport receives a camera and renders an image from it on the screen. In addition, it provides all functions of the main renderer, for example, cube maps rendering, stereo rendering, panoramic rendering and so on. A player is a node controlled through the input devices (keyboard, mouse, joystick). It has the camera set to it. Once a player has changed its position, its internal camera's view matrix will be changed as well. UNIGINE features several types of players: Player Dummy, Player Actor, Player Persecutor and Player Spectator. The terms discussed above regards the API only. The Camera panel in UnigineEditor manages cameras, which in terms of API would be called players. All opaque (non-transparent) geometry is rendered in the deferred pass. Transparent geometry is rendered in the forward pass. To know more about the applied rendering techniques, see the Rendering Sequence article. Switching the high-polygonal surfaces of the mesh to the low-polygonal ones. Switching the surfaces with complex materials to the surfaces with the simplified optimized materials. Switching several high-polygonal surfaces to a single simplified surface. Switching between LODs can depend not only on the distance from the camera, but also from the distance from the certain object. 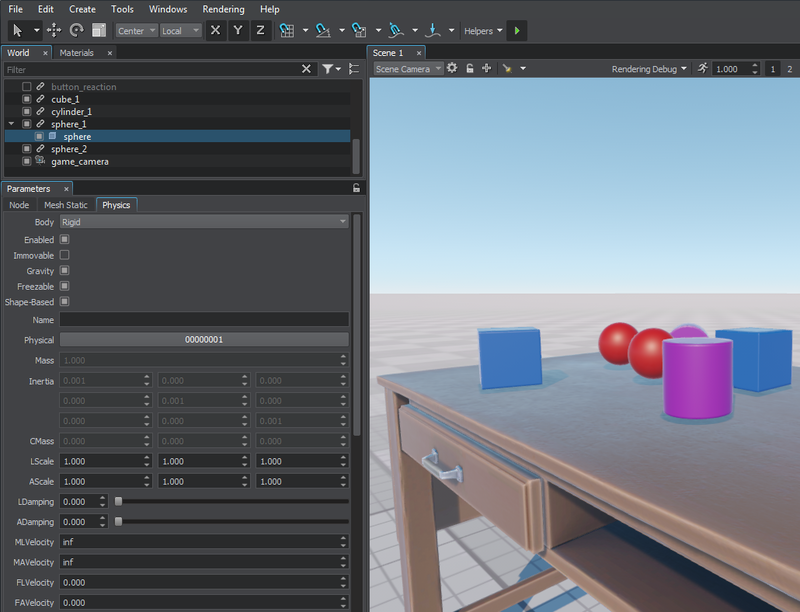 See the Setting up object LODs tutorial for the details. Render some objects to the viewport and not to render the others. Apply collision to some bodies and not to apply to the others. Render shadows for some objects and not to render for the others. Apply physics interaction for some objects and ignore the others. A bit masking algorithm compares 32-bits masks of each of two nodes using binary operator and. If masks match, one object will influence another object; if they don't, the objects won't interact. Collision detection (preventing moving through walls). Simulating perfectly elastic collisions (redistribution of kinetic energy). Simulation of simple mechanisms by rigid bodies and destructable joints. Simulation of basic physical phenomena: gravity, friction, buoyancy. Simulation of cloth and ropes movement. It is important to understand that built-in physics module is very generic one and works within specific range of parameters: for precise simulation of mission-critical tasks (i.e. flight dynamics) it is highly recommended to use specialized solutions. Like in any game-like physics, you should not use real masses and super velocities values. Physics is simulated with its own update FPS and is in effect within the physics simulation distance. Physical properties can be applied to the objects only. To assign an object some physical properties so that it could participate in interactions between objects or external physical forces, it should have a body. There are several types of bodies: Rigid, Rag Doll, Fracture, Rope, Cloth, Water, Path. Almost like in the real worlds, virtual physics of the body follows concepts of velocity, force, mass, density an so on. While a body simulates various types of physical behavior, a shape represents the volume (sphere, capsule, cylinder, box, convex hull) that a rigid body occupies in space. A physically simulated object usually has one body and one or several shapes which allow objects to collide with each other. A collision detection algorithm detects contact points between shapes and prevents them from penetrating each other. Contact points and normals are accessible via API. Joints are used to connect several objects with respect to the mass balance. There are different types of joints: Fixed, Hinge, Ball, Prismatic, Cylindrical, Suspension. There are global physics settings (gravity, penetration factor, etc.) affecting all physical objects present in the world. Importing into a runtime format with saving into an intermediate format with UnigineEditor ( .fbx, .tga, .lcp, etc.). 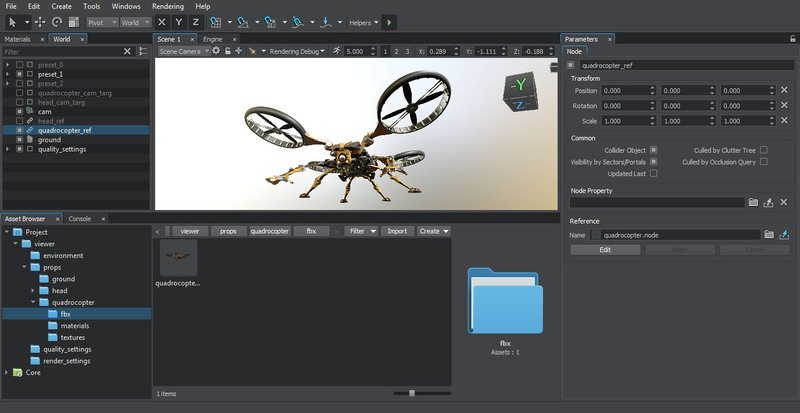 Importing directly into a runtime format with built-in to 3ds Max or Maya plugins. 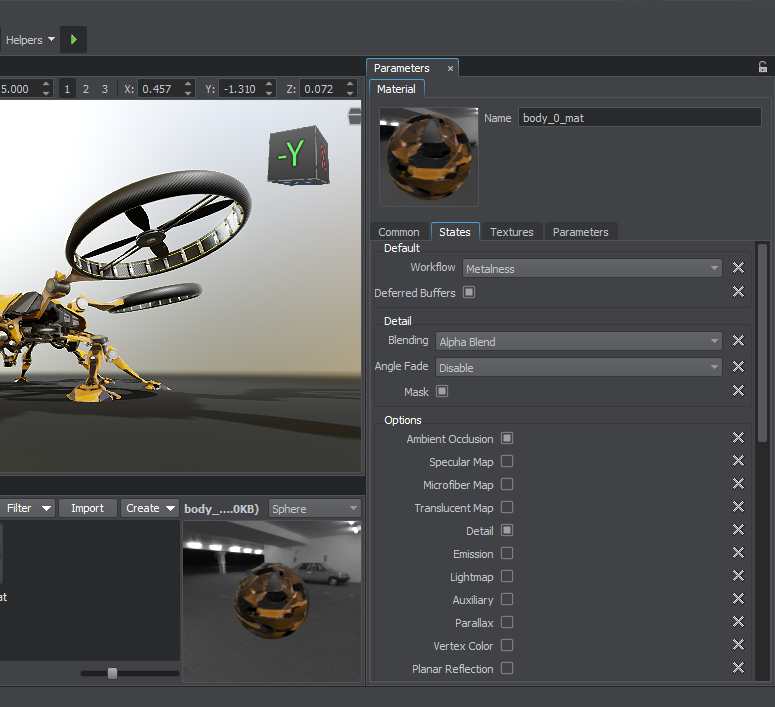 UnigineEditor allows you to assemble a virtual world: import and set nodes, assign materials and properties to them, setup lighting, set the global settings (physics, rendering, etc.) and more. It features What You See Is What You Get approach: you can instantly see the scene with final quality (as in the runtime). C++ for maximum performance and seamless integration with the existing code base. C# for a good balance between speed and ease of use. UnigineScript, fast iterative scripting language featuring instant compilation and thousands of useful functions. All *.cpp and *.h files inside of the data folder are scripts in UnigineScript language (they do not require compilation). File extensions are the same as for C++ just for proper syntax highlight in text editors. All the APIs are unified: every class, method, and constant are accessible through any API. However, there are minor language-specific differences. By design, UNIGINE allows having different programming languages (C++, C# and UnigineScript) for different pieces of your project. Usually, C++ is used for base classes and performance consuming operations; UnigineScript is used for application logic. You can call methods from one API when using another, and manually expand API functionality. Alternatively, you can stick to a single language, e.g. write your application in pure C++. System Logic is the code that is run during the whole application life cycle (its scope exists even when switching worlds). For applications written using UnigineScript, the system logic is written to the system script file (unigine.cpp). For C++ or C# applications, AppSystemLogic.cpp is created in the source folder of your project. It has implemented methods to put your logic code inside. World Logic is the logic of the virtual world. The logic takes effect only when the world is loaded. For applications written using UnigineScript, the world logic is written to the world script file (*.cpp named after your project). For C++ or C# applications, AppWorldLogic.cpp is created in the source folder of your project. It has implemented methods to put your logic code inside. Editor Logic is the logic of the editor. The logic takes effect only when the editor is loaded. For C++ or C# applications, AppEditorLogic.cpp is created in the source folder of your project. It has implemented methods to put your logic code inside. It is highly recommended to see the execution sequence to know the details, including multi-threaded mode. UNIGINE features a fast intersection detection algorithm. It can be used for ray casting, calculating line-of-sight (LOS), calculating height above terrain (HOT), etc. Intersections are found between the node's bounding volume and another bounding volume of the specified size. 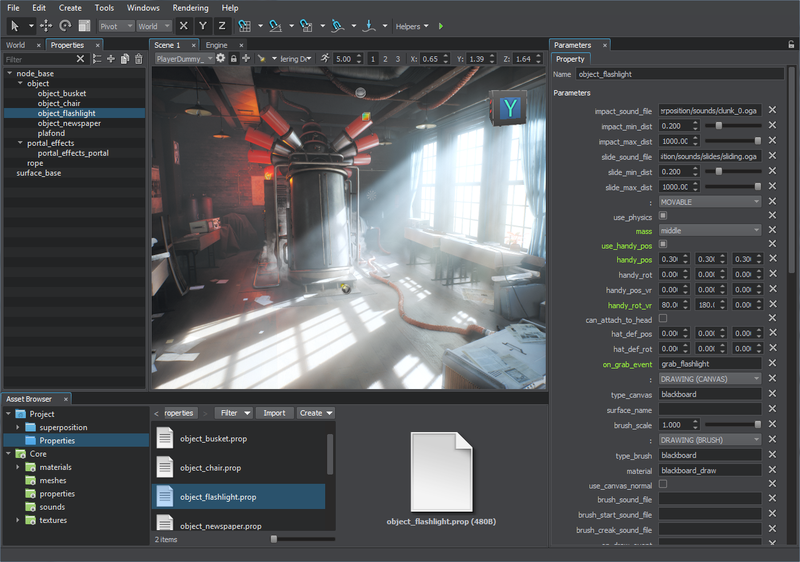 UNIGINE provides a rich set of built-in samples and demo projects covering basic principles of working with the engine (operations with the built-in nodes, output rendering, GUI setting, etc.). There are different samples for each of 3 programming languages. All samples come with the full source code. To check them, go to SDK browser -> Samples tab. Now you are prepared to start your experience with UNIGINE. Enjoy!